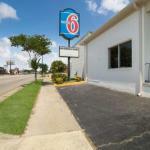 Located two blocks from South Carolina State University with free Wi-Fi complimentary continental breakfast and an outdoor pool the Super 8 Orangeburg offers budget-priced accommodations in a convenient location. This pet-friendly hotel has 46 rooms on two floors with some rooms designated non-smoking. Each room includes free Wi-Fi a refrigerator microwave and coffeemaker in addition to a seating area. Guests can take a refreshing dip in the seasonal outdoor pool and gobble up a complimentary continental breakfast each morning. Parking is free. The Super 8 is two blocks from South Carolina State University and five minutes from both Hillcrest Golf Course and the Stanback Museum and Planetarium. There are several restaurants within two miles and a few within walking distance. The Orangeburg Municipal Airport is three miles from the hotel.